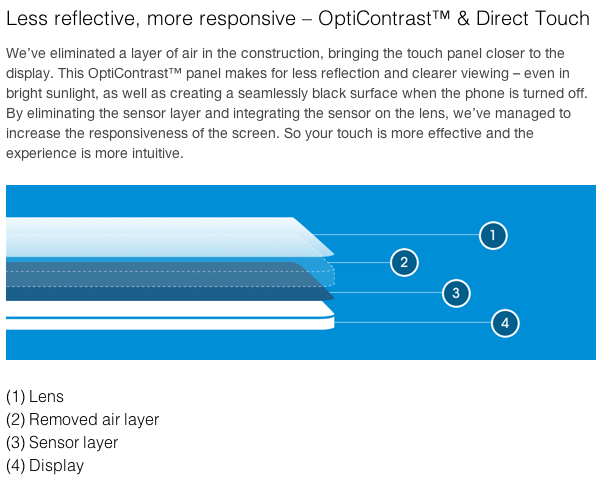 OptiContrast Panel and Sensor on lens technology confirmed on the Xperia Z! With the new technologies infused in the Xperia Z, viewing your smartphone under strong sunlight will pose you no problem. Experience better sensitivity when you navigate the phone too! Design is one of Sony’s strong points, and this technologies are no exception. Image source from Sony Mobile. This entry was posted in Xperia Product Line and tagged direct touch, less relfection, more responsive, opticontrast, sensor on lens, smartphone, sony, xperia, Xperia Z by knowyourxperia. Bookmark the permalink.